NYC, 05/23/2019, 7:00PM. Springfield Confidential: Jokes, Secrets, and Outright Lies from a Lifetime Writing for 'The Simpsons'. 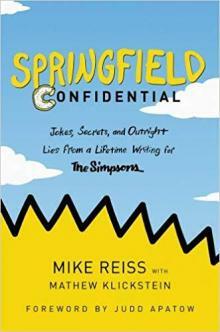 In celebration of The Simpsons' thirtieth anniversary, the show’s longest-serving writer and producer, Mike Reiss, offers a humorous look at the writing and making of the legendary Fox series that has become one of the most revered artistic achievements in television history.